Twidale and Bourne’s comments are appreciated by this author who respects their professional and long-standing experience in the field of modern geomorphology. I will seek to address each of Twidale and Bourne’s points in the order they were written. Patrick understands that there is only one zone of flared slopes on Uluṟu. This is not so. Two zones, located 4–5 m and 35–60 m above present plain level, and comprising assemblages of forms initiated at the weathering front in the shallow subsurface, are preserved on the southern face of Uluṟu. Although there exists a marked change in slope angle at the 35 m open-mouth caves, this author is unaware of any feature that correlates with, nor resembles, the very distinctive flared slopes at the 4–5 m mark. In order to accurately represent this response, many hours were spent looking over dozens of Uluṟu images, none of which provided any evidence of this particular distinctive feature. This is not to say they do not exist, just that they have been extremely elusive to the eyes of this very patient observer. Fig. 1. Contrast of concave out flared slopes and open mouthed caves. Photo: Shargaljut, Dreamstime. Fig. 1 is indicative of the 35 m horizon. Notice the flared slopes at the bottom of the image for comparison, a feature that is linearly absent at the open-mouth cave feature. Notice also the pinching out of the open-mouth cave to an unaltered surface that is linearly adjacent to the cave. If this horizon represents a subsurface weathering horizon, shouldn’t one expect to find continuity of weathering from one open-mouth cave to the next? A change of slope is evident at this horizon, but one should also expect some other weathering features that connect one cave to another. Patrick (2010, p.110 et seq.) 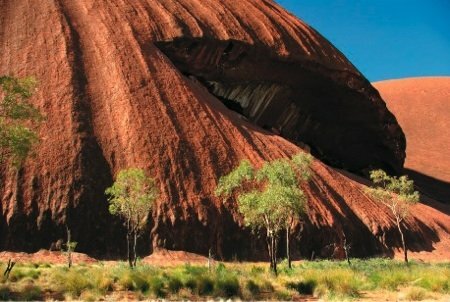 expresses concerns over the origin and fate of the arkose and related arenaceous and rudaceous rocks in which Uluṟu, Kata Tjuṯa and other residuals surviving in the southern Amadeus Basin are shaped . . . That Uluṟu was left in relief implies the stripping of a large volume of detritus that was transported by streams and rivers, the predecessors of the modern Finke and Palmer systems, and deposited in the eastern Amadeus and the western Lake Eyre basins. The idea of peneplain was a direct and logical outgrowth of his [Davis’] earlier controversial history which continues down to the present, and probably more has been written pro and con regarding it than about any other geomorphic idea (Thornbury 1969, p. 179). Most tourists wonder “how did that rock [Uluṟu] get up there?” but the real question is “where did all that rock go?” (Ollier and Pain 2000, p. 29). The sea is very effective at carving plains at the coast, and with sufficient time could it not carve plains of continental dimensions? . . . Arguments between proponents of marine erosion and those of terrestrial planation were great in the nineteenth century, but are scarcely heard today, although the question has not always been resolved (Ollier and Pain 2000, pp. 234–235). These are still developing and, as demonstrated during the occasional heavy rains, are caused by runoff. As photographs clearly show, the depressions increase in size downslope, presumably reflecting both increasing volumes of water and abrasive sand included as load. Twidale and Bourne here acknowledge the uniformity of Uluṟu’s potholes, but fail to see the importance of such a pattern. Why are the hole sizes increasing downslope? If Uluṟu’s uppermost elevation is indicative of older topography, why do these erosion surfaces not start off large, becoming smaller down the strike of Uluṟu’s upturned strata? Why have uniformity and continuity at all over the surface of Uluṟu? One should conclude that such characteristics are indicative of a contemporaneous Uluṟu surface from top to bottom, not one that is at times separated by millions of years. Third, torrential rains caused the inundation of the Amadeus Basin and the formation of a lake “several tens of meters” deep. Its level changed in time but wave action at the margins modified the southern flank of Uluṟu to produce the distinctive 30–65 m and 4–5 m landform assemblages. Even if Uluṟu’s flared slopes are not the direct result of wave attack, epigenic processes such as this may provide another more viable interpretation (Patrick 2010, p. 115). Fig. 2. Sub-areal, epigenically derived flared slope features (arrowed). Photo: Matthew Weinel, Dreamstime. flared slopes and cliff-foot caves [tafoni caves] . . . indicate another [period of weathering] when the hill-plain junction stood 4–5 m higher than at present (Twidale 2007, p. 110). Fig. 3. Tafoni cave with internal concave out flared slope feature and evacuated sub-circular blocks lying on the adjacent piedmont. This image is used by permission of the copyright owner, Billogs. Yet tafoni is almost always understood in terms of subaerial weathering? That this is the case for Uluṟu is evidenced by evacuated sub-circular blocks lying next to the tafoni caves on the adjacent piedmont (see fig. 3). Once the concave-out tafoni-related caves weather out most of the host rock (in large circular blocks), all that remains is a lip or hood that covers the cave. Once this hood itself weathers and erodes away, one is left with the concave out flared slope feature under discussion. Tafoni weathering rates are still poorly understood, but large granite blocks left over from the Last Glacial Maximum have evidenced huge amounts of in situ tafoni-related decomposition in only a few thousands of years (Brandmeier et al, 2011). It is the contention of this author, then, to postulate a combination of spring sapping at Uluṟu’s base (much like that seen in the Mutitjulu Waterhole), along with tafoni related decomposition. This decomposition would have been accelerated by the presence of an ephemeral inland brackish lake. Although the lake was at times transient, high water periods would also be responsible for mechanical disarticulation and removal of rock detritus and perhaps contributed to the concave out shape. For the reader there are problems with the author’s use of words and phrases. 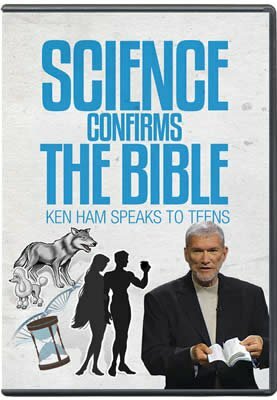 For instance, what is a temporal lake (Patrick 2010, p. 113); what is a land breach (p. 108); how can a watershed scour out a valley (p. 108); and how can a subsiding lake achieve regional planation (p. 114)? It will be important to clarify these possibly confusing terms. By temporal lake, I mean to suggest a lake that is short-lived. I would here like to add my contention that this lake was probably brackish, and ephemeral being at times dry, while at other times having a high water mark. As for the watershed, I was simply delineating Twidale’s hypothesis using, perhaps, too few words. The entire double planation process as well as subsequent erosion was the intended meaning. As for the final misunderstanding, this author holds to a catastrophic marine transgression that was responsible for regional planation, not a subsiding lake. Examination of available topographic maps suggests it would have occupied most of the present Amadeus Basin. But what blocked the lake, and where are the lake deposits and associated fossils? The plains around Uluṟu are underlain by sequences of mixed sediments (Twidale 1978) with a cover of alluvial and wind-blown sand. Thus, it is simply incorrect to state that lacustrine beds 180 m thick (and more) have been located in the vicinity of Uluṟu (Patrick 2010, pp. 117–118). The plains that surround [Uluṟu and Kata Tjuṯa] are depositional. They are underlain by Cainozoic sequences comprising lacustrine, alluvial, and aeolian beds, the thickness of which varies (Twidale and Harris 1977, p. 46). They later go on to suggest that some of the bore-holes in the area measured 180 m deep of sediment. Since the aeolian sediments chiefly represent only the very top sediments, I incorrectly assumed that the rest of this sediment was made up of lacustrine-type deposits, when in fact they mostly represent lacustrine as well as fluvial sediments. Exactly what percentage is made up of what sediment was not indicated. Nevertheless, deep lacustrine deposits are known in the area as referenced above. 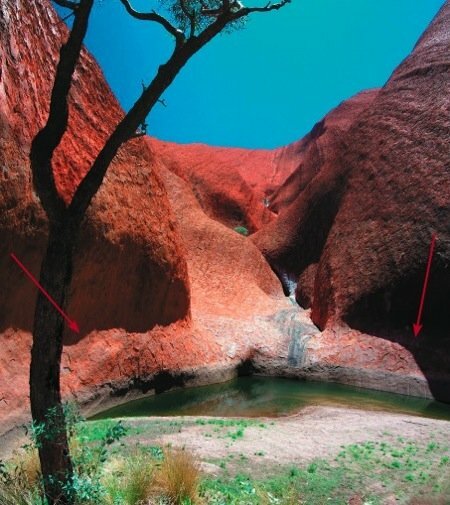 With the possible exception of Mutitjulu and other waterholes located within structural clefts on the southern face, there is no evidence of sapping (Patrick 2010, p. 116) in the form of springs or seepages around the base of Uluṟu. A closer look at fig. 11 in Patrick (2010) should, I think, convince the reader that other areas also evidence spring sapping. Notice the incredibly close correlation of this concave down shaped feature to the water sapping features in Patrick (2010), (figs 12 and 13). Note also the presence of salts. There still remain severe problems related to Twidale and Bourne’s Double Planation Hypothesis. What testable data exists to verify the processes that removed vast amounts of material? Why is the topography exceptionally flat? Why does continuity of external erosion features exist all over the surface of Uluṟu? Why only one level of flared slopes, and why only at its base? 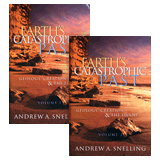 Given these noteworthy unanswered questions, it seems much more reasonable to assume a catastrophic marine transgression that carved out the basic Uluṟu residual. Extreme changes in climate were responsible for the presence of an inland, ephemeral and brackish lake that contributed to the entire suite of features exhibited over the entirety of Uluṟu’s surface. Since this suite of features is best explained by epigenic processes such as spring sapping and tafoni related rock decomposition, this leaves mainstream geomorphologists with an obvious conundrum—how did the original residual form (since these features themselves are used to hypothesize a slow and gradual decrease in land level)? Those limited to slow and gradual processes will be hindered in their investigations due to the almost pervasive and outright anathema of ideas related to catastrophic marine transgressions. Brandmeier, M., J. Kuhlemann, I. Krumrei, A. Kappler, and P. W. Kubik. 2011. New challenges for tafoni research. A new approach to understand processes and weathering rates. Earth Surface Processes and Landforms 36, no. 6:839–852. Ollier, C. and C. Pain. 2000. The origin of mountains. London, United Kingdom: Routledge. Patrick, K. 2010. 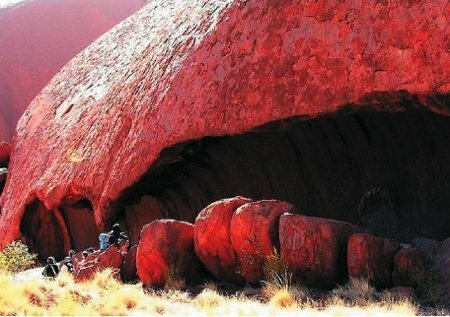 Geomorphology of Uluṟu, Australia. 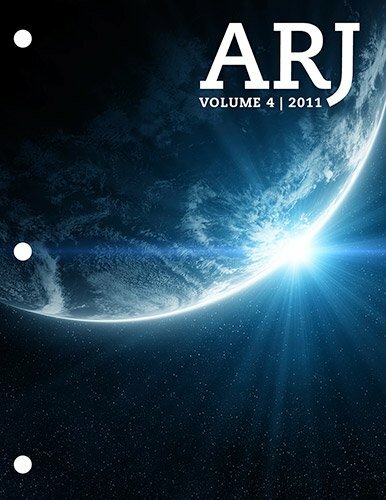 Answers Research Journal 3:107–118. Thornbury, T. 1969. Principals of geomorphology, 2nd ed. New York, New York: John Wiley and Sons. Twidale, C. R. 1978. 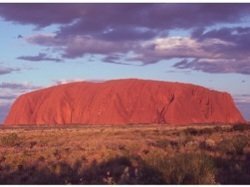 On the origin of Ayers Rock, central Australia. Zeitschrift für Geomorphologie Supplement Band 31:177–206. Wayland, E. J. 1934. Peneplains and some other erosional platforms. Annual Report and Bulletin, Note 1, pp. 77–79. Kampala: Protectorate of Uganda Geological Survey, Department of Mines.